The day after the election of Pope Francis I, the Grand Orient of Italy (GOI), which represents Freemasonry in that country, issued a formal communiqué praising him for the first egalitarian measures he took on the day of his election. The document also made public the Freemasons' expectations that the new Pope shall lead the Church on the democratic path desired by Masonry. This attitude was registered on the official GOI website. 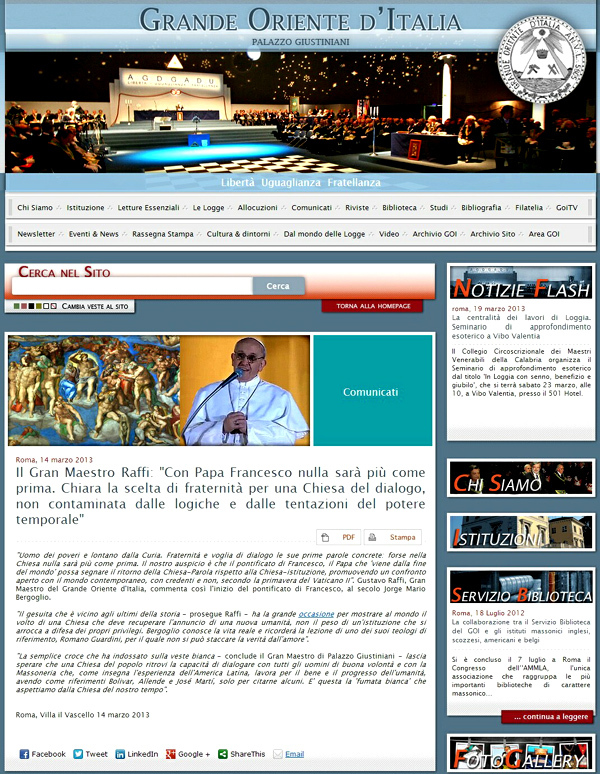 A photocopy of its webpage is found below, followed by a enlarged copy of the part referring to Francis I. The photos are preceded by our translation of the Italian, in blue. Grand Master Raffi: "With Pope Francis, nothing will be more as it was before. It is a clear choice of fraternity for a Church of dialogue, which is not contaminated by the logic and temptations of temporal power"
"A man of the poor far away from the Curia. Fraternity and the desire to dialogue were his first concrete words. Perhaps nothing in the Church will be as it was before. Our hope is that the pontificate of Francis, the Pope who 'comes from the end of the world' can mark the return to the Church-Word instead of the Church-Institution, promoting an open dialogue with the contemporary world, with believers and non-believers, following the springtime of Vatican II." 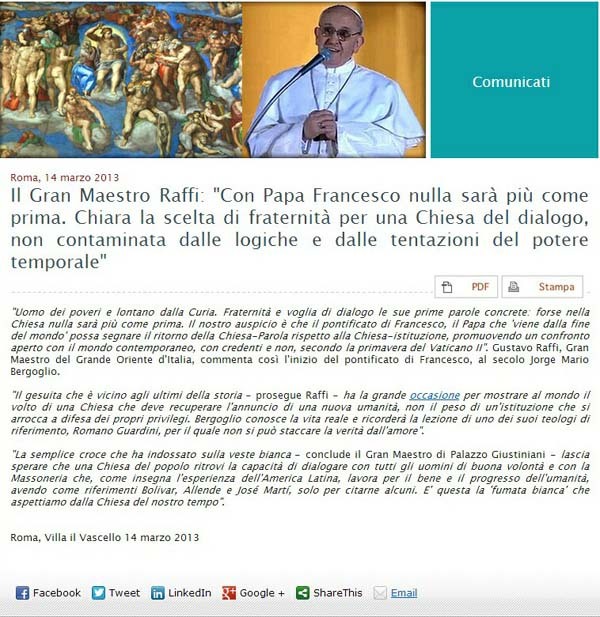 These were the comments of Gustavo Raffi, Grand Master of the Grand Orient of Italy, at the beginning of the pontificate of Francis, in the world Jorge Mario Bergoglio.